Early versions of waterbeds were first used for therapeutic purposes in the 1800s. 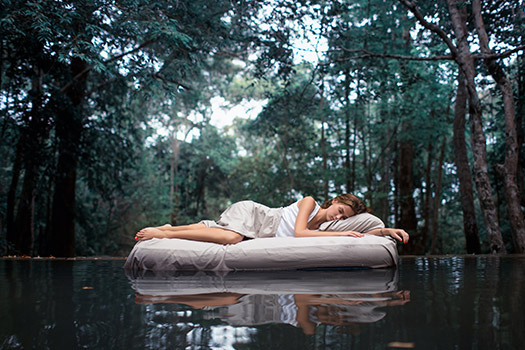 The modern incarnation of water-filled mattresses dates to the 1970s, and such beds are making a comeback these days. In addition to seeking out alternatives to spinal fusion, the concept of gaining therapeutic benefits from using waterbeds is something people with back pain are considering when exploring sleeping options. However, there is some debate as to whether or not sleeping on a waterbed eases back pain or reduces the risk of waking up sore and stiff. Heated waterbeds can be especially therapeutic. The controlled level of heat you’ll have on your back as you sleep has similar benefits to applying a heating pad. An increased blood flow from the steady warmth also delivers more oxygenated blood and nutrients to your spine and its tissues. In one study, 15 percent of people with back pain reported relief when making the switch to a waterbed, and nearly 10 percent said their discomfort became worse. Another study found differences with a waterbed or foam mattress over a standard mattress to be minimal. If you have existing back pain, check with your doctor before considering a waterbed. The doctor should be able to give you an idea if you’ll be making a wise choice or doing more harm than good. Even if a waterbed isn’t right for you, be just as diligent about selecting any type of bed. Try any mattress you’re considering in person to see if it’s supportive enough. Also, some stores offer a trial period, so take advantage of opportunities to try a mattress before investing in it. Though sleeping in a waterbed may be helpful to some degree, people with chronic back pain may need a more extensive solution. At The Spine Institute Center for Spinal Restoration, we specialize in various types of surgery that can help you find relief. Whether you need a traditional fusion procedure or Coflex surgery, the trusted surgeons at The Spine Institute are here to help. Call our office today at 310-828-7757 to schedule an in-person evaluation.